Click on the image to see it rotate. 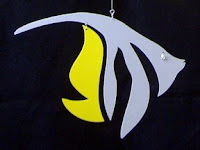 "Protecting Crescents" Mobile, PVC, 38"h x 24" swing diameter. To see other Mobiles click on the web site link in the right hand column. 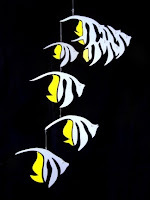 My "Angel Fish" Mobile is now available in three versions. It measures 40" high by 28" wide. The construction is all 1/16" aluminum with stainless steel connectors.